The exhibition of the 12 award-winning works at Aratoi marks the first time this national award has come to the Wairarapa. Exhibition continues until 23 June 2019. Heather Hourigan, Coordinator of the 2019 Award, will speak at Aratoi for the opening. In partnership with Whakatāne District Council. This year, there was a record number of over 500 entries, with 78 Finalists. Australian art academic and critic Dr Christopher McAuliffe was the international guest judge of the final award winners. 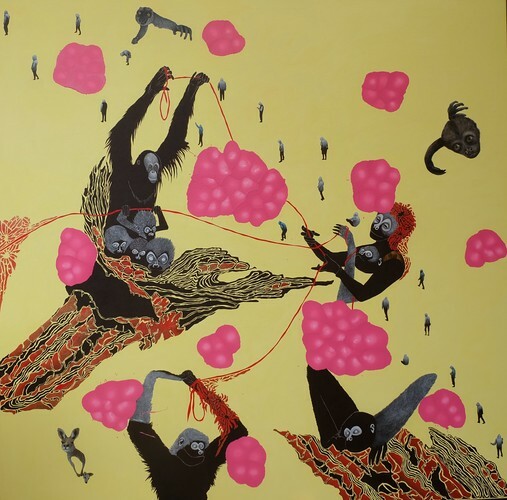 John Brown is the recipient of the 2019 Molly Morpeth Canaday Trust Major Award ($10,000 prize) for his work 'The Battle for Tuber'. Pictured: Seeking Connections by Lea-Anne Sheather, of Whakatāne (detail). Sheather received the Arts Whakatāne Highly Commended Award ($1,000).